Six single-knob tools for fast audio repair. Whether you are just starting out, or you're a seasoned pro, you often need to fix common audio problems. 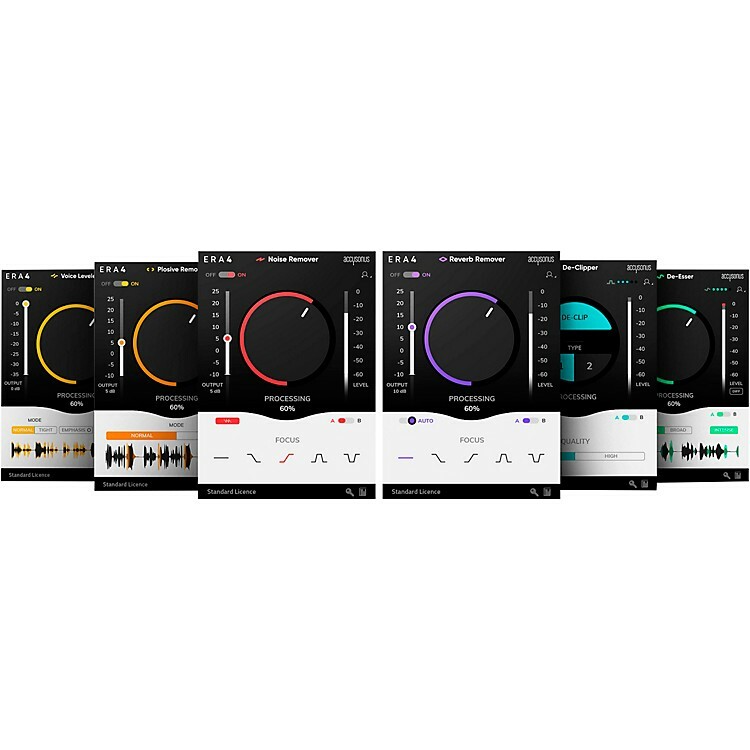 Say hello to the ERA Bundle and experience the next generation of audio repair technology. Use a single knob to clean up your sound in seconds and focus on the creative part of your work. Noise happens, but you don’t have to settle! Use the ERA Noise Remover to easily reduce or completely remove unwanted fans, air-conditioners, electric hum & hiss or any other background noise. It's as simple as turning a single knob. Reverb is the unavoidable result of room acoustics. It can make your audio sound distant, "echoey" or hollow. Get the single-knob ERA Reverb Remover to quickly reduce excessive reverb and bring your sound into focus. Add clarity, clean up your dialogue or tighten up your musical performance. Harsh sibilance can be very annoying both in dialogue and vocal recordings. The ERA De-Esser is an easy-to-use single-knob plugin that allows you to smooth out audio problems caused by excessive sibilance consonants (such as "s", "z", "ch", "j" and "sh"). Improve the quality of your audio with a single knob. Clipping results from over-saturation and usually sounds like a harsh distortion. When you look at the loud parts of your input waveform, you can see clippings as blocks of audio that are chopped off. Repair your clipped audio in seconds with ERA De-Clipper. Clean-up your sound with Accusonus!